This information is provided courtesy of Emily Scholl, a graduate student who is interested in promoting occupational therapy's involvement in wellness programs. She found an interesting bill that promotes wellness in NY State and is advocating for occupational therapy to be added to the existing bill. 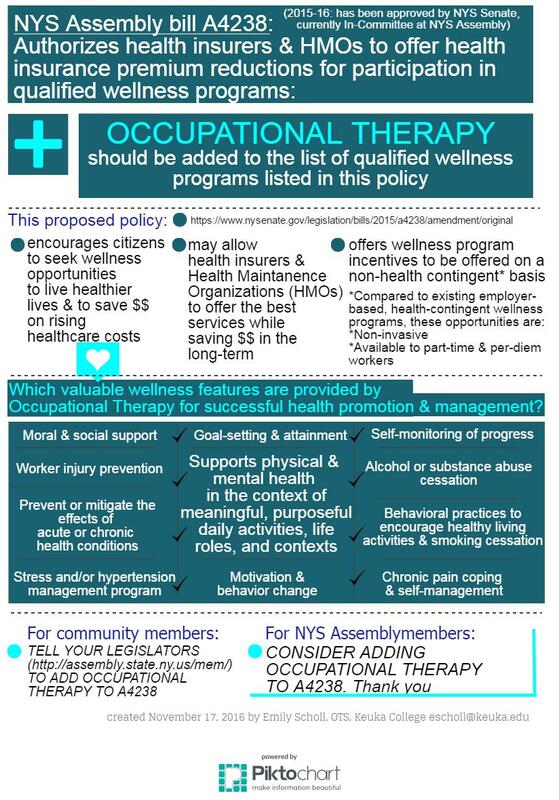 "Occupational Therapy should be added to the list of qualified wellness programs in NYS Assembly bill A4238. The 2015-16, in-process, NYS Assembly bill A4238 authorizes NYS health insurers & HMOs to provide policyholders with reductions in healthcare premiums and potentially waiving related costs or co-payments, in exchange for active, voluntary participation in approved wellness programs. This policy would operate on a non-health contingency basis, which means that obtaining these financial rewards would NOT be based upon personal health details. Participation would be enough. People want to live healthy, successful, meaningful lives. OT should be added to the list of wellness programs in this bill. Why? Lifestyle education and enacting personal change is hard. It requires moral support, goal-setting, guidance, enjoyable activities, collaboration, and a greater degree of involvement than just knowing what one “should” be doing. The features of wellness programs that are outlined in this bill would be greatly supported by the occupational therapy professional skillset. If we can get car insurance discounts for participating in related programs, why not get health insurance discounts for participating in occupational therapy wellness programs? This would allow the citizens of NY to save on rising healthcare costs AND improve health! Check out the poster attached below or click on this link for a larger version in your browser. Thank you!"